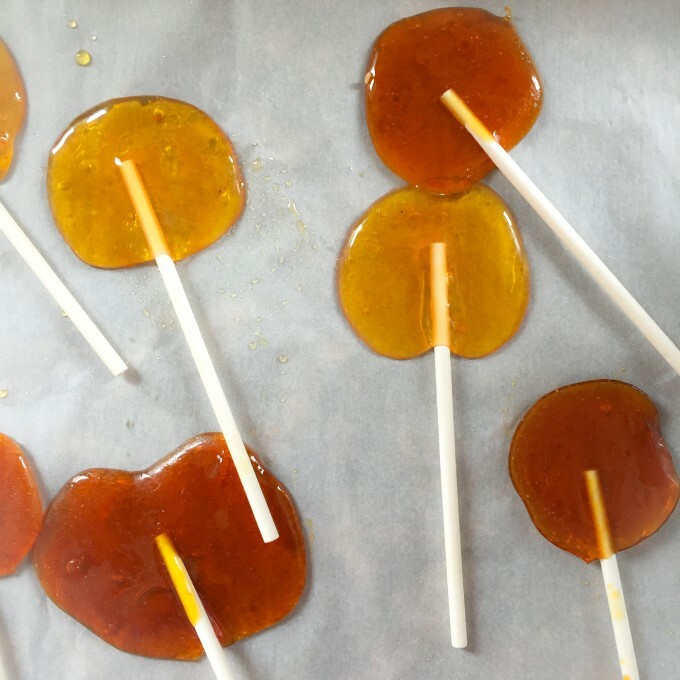 Honey Vanilla Toffee Lollipop Candy ! I haven’t had “candy” in so long it’s nuts, and I jumped at the chance to make some lollipops. While these aren’t really durable as candy in the long term (they turn to toffee fast out of the freezer) if you can’t have sugar, this Honey Toffee candy is a super-treat. The candy is from the classic SCD diet book “Breaking The Viscious Cycle” which I’ll be sharing much more of very soon as it’s a life-saver for so many (including me!) And the methodology of the candy has been amended to work in a way that seems to work! Place honey, water and vinegar in a high sided sauce pan and bring to a gentle boil. Once the boiling occurs and it begins to foam, slightly reduce heat as you do not want to burn the honey. If you have a candy thermometer the honey mixture should be done at around 300 degrees. If you do not have a thermometer, you can place a small amount of the mixture in cold water to see if it hardens and firms up. Then cook it even longer. Cool it off by putting the bottom of the pot into cold water…then let it cool. It’s easier to pour. Place parchment or wax paper over a large baking sheet. Lay down your lollipop sticks if you’d like to be adventurous about 3 to 4 inches apart and teaspoon the mixture onto the stick … about half inch up. Or pour on one big sheet on parchment paper and let it freeze, then shatter it while frozen. Store it in the freezer… and it’s so satifying as it melts…! Feng Shui Your Internet Habits! A Simple Exercise To Get Un-Stuck & Soar To The Next Level In Life This Week! Feng Shui To Recharge Your Creative Spirit!